Common Yellow Day Lily (Hemerocallis lilioasphodelus): growing, planting, caring. A big daylily with yellow flowers. 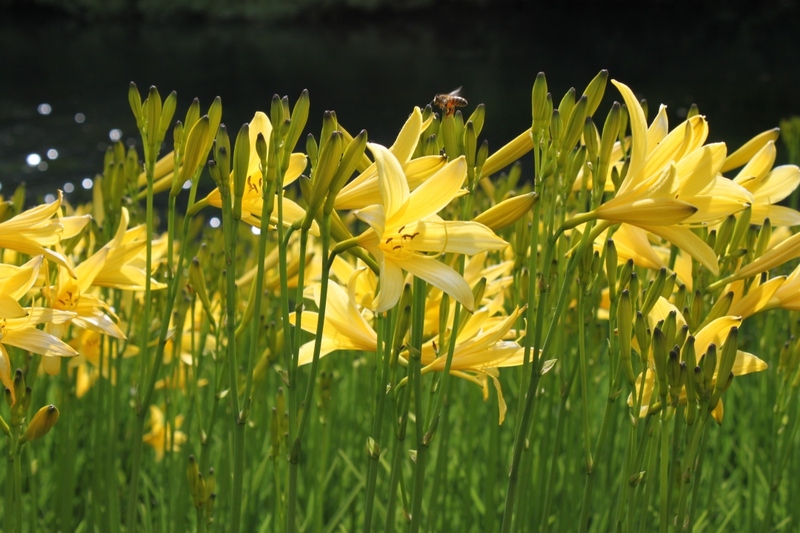 Hemerocallis lilioasphodelus - the type species - grows in big, spreading clumps, with leaves up to 75 cm (30 in) long and sweetly fragrant, lemon-yellow flowers. Daylily is the common name for plants in the Hemerocallis genus which belong to the Liliaceae family according to the classic classification. Some cultivars reflower later in the season, in particular if their fructifications are pruned. The flower is made up of three petals and three sepals, collectively called tepals, each with a midrib in either the same or contrasting color. The center most part of the flower, called the throat, is generally a different color. It has six stamens, each with a two-lobed anther. After pollination, the flower forms a capsule with three locules. Daylilies with yellow, pink, and other pastel colored flowers need direct sunlight to bring out all of their colors; the darker red and purple varieties need shade. They have a flowering period that is relatively short according to type. Some flower at the beginning of spring where as others wait until summer or even autumn. Most daylilies flower for one to five weeks, but some "rebloomers" flower twice a year. Plant your daylilies in spring or in autumn. 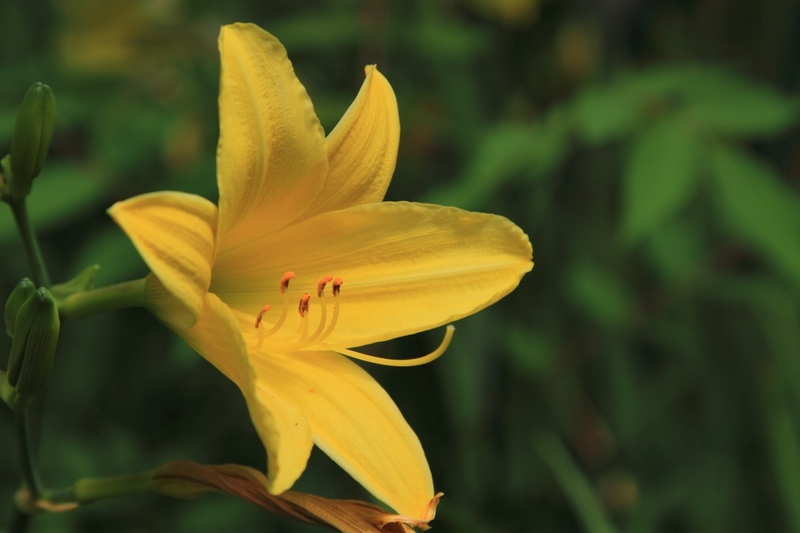 In the open soil: Choose a spot, preferably with partial shade during the hottest hours, knowing that the daylily flowers more when it has sun for part of the day. Ideally, fertilize the soil before planting. Potted: The daylily is a large perennial, so plant it in a large container (of at least 5 liters). Be sure that your pots have a hole at the bottom. You can place a layer of gravel or clay pebbles at the bottom to improve draining. In all cases, place each plant 30 cm apart in order to leave it with room to grow. Tamp the soil down well so that the roots are not in contact with air, then water generously. Water regularly the first weeks. Watering daylilies is also recommended in spring until flower buds form if it is dry out, but then, it will handle drought well if well established. If potted, it is recommended to water it regularly in the summer to avoid drying out the plant. Fertilize before winter (when you change the mulch for example), by providing moderately decomposed compost or manure and a light hoeing to incorporate it. That way your provision will have the time to decompose and will be ready in spring for the plant's regrowth. Divide the tuft in March or September (March for evergreen species). Daylilies are edible, and depending on the variety and exposure, their taste changes. Harvest the flowers in the summer to decorate your salads and desserts, or make donuts. Note that the more fragrant the flowers, the less tasty they are. Harvest tubers in winter and prepare them like potatoes. Young shoots are also edible, when they come out in the spring. They can be eaten raw or cooked like asparagus. Mulching the perennial plants will save you from watering and weeding and will even fertilize the soil a bit as it decomposes. If you mulch to keep the soil damp, be careful not to create an excess of moisture, which could lead to black rot or spots on the leaves.